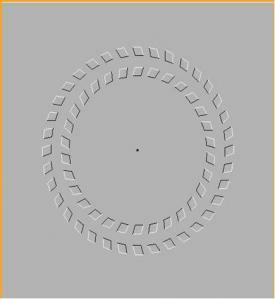 Look at the dot in the centre and move your head towards or away from the image – the surrounding circles seem to move. Anyone know why? Could you use such effects to make advertisements, or road-safety signs, more noticeable? Interesting. Is the raised relief, with the light source apparently rotating around the centre, key to this illusion?